American test pilot astronaut 1987-1997. Status: Inactive; Active 1987-1997. Born: 1952-05-14. Spaceflights: 3 . Total time in space: 25.23 days. Birth Place: Flint, Michigan. Donald R. McMonagle (Retired Colonel, USAF) became the Manager, Launch Integration,at the Kennedy Space Center, Florida, effective August 15, 1997. In this capacity he is responsible for final Shuttle preparation, launch execution, and return of the orbiter to KSC following landings at any location other than KSC. He is chair of the Mission Management Team, and is the final authority for launch decision. McMonagle was born on May 14, 1952, in Flint, Michigan, and graduated from Hamady High School, Flint, Michigan, in 1970. McMonagle received a Bachelor of Science degree in Astronautical Engineering from the United States Air Force Academy in 1974 and a Master of Science degree in Mechanical Engineering from California State University-Fresno in 1985. McMonagle completed pilot training at Columbus Air Force Base (AFB), Mississippi, in 1975. After F-4 training at Homestead AFB, Florida, he went on a 1-year tour of duty as an F-4 pilot at Kunsan Air Base, South Korea. He returned from overseas to Holloman AFB, New Mexico, in 1977. In 1979, McMonagle was assigned to Luke AFB, Arizona, as an F-15 instructor pilot. In 1981, he entered the USAF Test Pilot School at Edwards AFB, California, and was the outstanding graduate in his class. From 1982 to 1985, McMonagle was the operations officer and a project test pilot for the Advanced Fighter Technology Integration F-16 aircraft. After attending the Air Command and Staff College at Maxwell AFB, Alabama, from 1985 to 1986, he was assigned as the operations officer of the 6513th Test Squadron at Edwards AFB. McMonagle has over 5,000 hours of flying experience in a variety of aircraft, primarily the T-38, F- 4, F-15, and F-16. 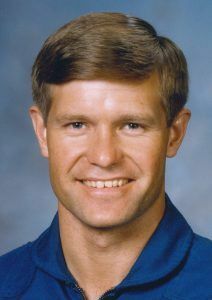 McMonagle was selected as an astronaut by NASA in June 1987. A veteran of three space flights, McMonagle has logged over 605 hours in space. McMonagle flew as a mission specialist aboard the Space Shuttle Discovery on Department of Defense mission STS-39 in April 1991. During this highly successful 8-day mission, the seven-man crew deployed, operated, and retrieved a remotely-controlled spacecraft and conducted several science experiments to include research of both natural and induced phenomena in the Earth's atmosphere. In January 1993, McMonagle served as pilot on STS-54 aboard the Space Shuttle Endeavour. The 6-day mission featured the deployment of a Tracking and Data Relay Satellite (TDRS), and the collection of information about celestial x-rays using a Diffuse X-Ray Spectrometer. McMonagle commanded a crew of six aboard Space Shuttle Atlantis on the STS-66 Atmospheric Laboratory for Applications and Science-3 (ATLAS-3) 11-day mission in November 1994. In January 1996 McMonagle was assigned the task to establish a new Extra-Vehicular Activity (EVA) Project Office responsible for managing all NASA resources associated with space suits and tools used to conduct space walks in support of Space Shuttle and the International Space Station. This role included responsibility for developing and implementing a plan for research and development of next generation space suits to support future human space exploration. McMonagle's accomplishments have earned him many notable awards. He has received the Air Medal, Meritorious Service Medal, three Air Force Commendation Medals, the Defense Meritorious Service Medal, the Distinguished Flying Cross, the Liethen-Tittle Award (Top Graduate from USAF Test Pilot School), three NASA Space Flight Medals, the NASA Exceptional Service Medal, and the NASA Outstanding Leadership Medal. McMonagle is a member of the Society of Experimental Test Pilots; Association of Graduates, U. S. Air Force Academy; and Association of Space Explorers. McMonagle is married to the former Janyce Morton of Phoenix, Arizona. They have two children and reside in Merritt Island, Florida. This is the only version available through NASA. Further updates should be requested from the above named individual. Born May 14, 1952, in Flint, Michigan. Married to the former Janyce Morton of Phoenix, Arizona. They have two children. He enjoys all racket sports, light aircraft flying, and snow skiing. His parents, Joseph & Jewel McMonagle, reside in DeLeon Springs, Florida. Her parents, James & June Morton, reside in Phoenix. Graduated from Hamady High School, Flint, Michigan, in 1970; received a bachelor of science degree in astronautical engineering from the U.S. Air Force Academy in 1974, and a master of science degree in mechanical engineering from California State University-Fresno in 1985. Member, Society of Experimental Test Pilots, Association of Graduates, U.S. Air Force Academy, and Association of Space Explorers. Recipient of the Air Medal, Meritorious Service Medal, 3 Air Force Commendation Medals, the Liethen-Tittle Award (Top Graduate from USAF Test Pilot School), and three NASA Space Flight Medals. McMonagle graduated from pilot training at Columbus Air Force Base (AFB), Mississippi, in 1975. After F-4 training at Homestead AFB, Florida, he went on a one year tour of duty as an F-4 pilot at Kunsan Air Base, South Korea. He returned from overseas to Holloman AFB, New Mexico, in 1977. While there, he transitioned from the F-4 to the F-15 aircraft. In 1979, McMonagle was assigned to Luke AFB, Arizona, as an F-15 instructor pilot. In 1981, he entered the USAF Test Pilot School at Edwards AFB, California, and was the outstanding graduate in his class. From 1982 to 1985, McMonagle was the operations officer and a project test pilot for a technology demonstration aircraft, the Advanced Fighter Technology Integration (AFTI) F-16. This was a joint USAF/NASA/USN flight test project conducted from the NASA Dryden Flight Research Facility at Edwards AFB. McMonagle attended the Air Command and Staff College at Maxwell AFB, Alabama, from 1985 to 1986. He was assigned as the operations officer of the 6513th Test Squadron at Edwards AFB when selected for the astronaut program. He has over 5,000 hours of flying experience in a variety of aircraft, primarily the T-38, F-4, F-15, and F-16. Selected by NASA in June 1987, McMonagle's technical assignments have included the Space Shuttle main engines, external tank, and main propulsion system. He worked with the Mission Control Team for Missions STS-32, STS-33, and STS-36 as a spacecraft communicator (CAPCOM), a position traditionally held by an astronaut. The CAPCOM is the focal point for all verbal communication with the crew in the orbiting vehicle. He has served as the Astronaut Office representative for development of crew procedures, the Shuttle Mission Simulator, and training procedures in the Shuttle Training Aircraft. McMonagle also led a team of astronauts responsible for supporting flight crews for Shuttle launch/ingress and landing/egress. He is presently the Astronaut Office representative to the Shuttle Safety Program. A veteran of three space flights, STS-39 in 1991, STS-54 in 1993, and STS-66 in 1994, McMonagle has logged over 605 hours in space. McMonagle flew as a mission specialist aboard the Space Shuttle Discovery on Mission STS-39. This eight-day unclassified Department of Defense mission launched from Kennedy Space Center on April 28, 1991, and landed there on May 6, 1991. During this highly successful mission, the seven-man crew worked around-the-clock in a two-shift operation. They deployed, operated, and retrieved a remotely controlled spacecraft and conducted several science experiments to include research of both natural and induced phenomena in the Earth's atmosphere. McMonagle was the pilot during his shift of operations, responsible for flying the Space Shuttle through several maneuvers and operating Discovery's systems in support of science experiments. Mission duration was 199 hours and 22 minutes. McMonagle served as pilot on STS-54 (January 13-19, 1993) aboard the Space Shuttle Endeavour. The six-day mission featured the deployment of a Tracking and Data Relay Satellite (TDRS), the collection of information about celestial x-rays using a Diffuse X-Ray Spectrometer (DXS), a 4 hour and 20 minute space walk by two fellow crewmen to explore the limits of human performance in working outside the spacecraft, and the demonstration of physics principles of common toys to an interactive audience of elementary school students across the United States. McMonagle executed over 100 Orbiter maneuvers to properly point the DXS. In preparation for future space station operations, McMonagle conducted the first on-orbit shutdown and restart of one of the three electricity-producing fuel cells on the Orbiter. Mission duration was 143 hours and 38 minutes. McMonagle commanded a crew of six aboard Space Shuttle Atlantis on the STS-66 Atmospheric Laboratory for Applications and Science-3 mission (November 3-14, 1994). ATLAS-3 was part of an ongoing program to determine the Earth's energy balance and atmospheric change over an 11-year solar cycle. Eight instruments in Atlantis' cargo bay measured the total and spectral output of the sun and chemical constituents in the atmosphere including measurements of global ozone coverage. The mission also included the second in a series of four German-sponsored flights of a Shuttle Pallet Satellite (SPAS). Named CRISTA/SPAS, the satellite was deployed for 8-days carrying two instruments (CRISTA and MAHRSI) which measured small scale dynamic variations in the middle atmosphere and unique chemicals which affect ozone chemistry. During the rendezvous with SPAS, McMonagle demonstrated the first "R-bar" approach flying up from below as opposed to the traditional approach from ahead of a rendezvous target. The 11-day mission was completed with McMonagle's landing the Atlantis at Edwards Air Force Base after 175 orbits of the Earth. Mission duration was 262 hours and 34 minutes. McMonagle currently serves as the Director, EVA Project Office, Johnson Space Center. Family: Astronaut. Country: USA. Flights: STS-39, STS-54, STS-66. Projects: STS. Agency: USAF. Bibliography: 12, 5770. 1952 May 14 - . Birth of Donald Ray 'Don' McMonagle - . Nation: USA. Related Persons: McMonagle. American test pilot astronaut 1987-1997. 3 spaceflights, 25.2 days in space. Flew to orbit on STS-39 (1991), STS-54, STS-66..
1994 November 3 - . 16:59 GMT - . Launch Site: Cape Canaveral. Launch Complex: Cape Canaveral LC39B. Launch Platform: MLP3. LV Family: Shuttle. Launch Vehicle: Space Shuttle. STS-66 - . Call Sign: Atlantis. Crew: Brown, Clervoy, McMonagle, Ochoa, Parazynski, Tanner. Payload: Atlantis F13 / Atlas-3. Mass: 10,544 kg (23,245 lb). Nation: USA. Related Persons: Brown, Clervoy, McMonagle, Ochoa, Parazynski, Tanner. Agency: NASA Houston. Program: STS. Class: Manned. Type: Manned spaceplane. Flight: STS-66. Spacecraft Bus: Shuttle. Spacecraft: Atlantis. Duration: 10.94 days. Decay Date: 1994-11-14 . USAF Sat Cat: 23340 . COSPAR: 1994-073A. Apogee: 301 km (187 mi). Perigee: 284 km (176 mi). Inclination: 57.00 deg. Period: 90.40 min. Carried Atlas-3 laboratory; deployed and retrieved CRISTA-SPAS. Payloads: Atmospheric Laboratory for Applications and Science (ATLAS) 3, Cryogenic Infrared Spectrometers and Telescopes for the Atmo-sphere (CRISTA)-Shuttle Pallet Satellite (SPAS) 1, Experiment of the Sun for Complement-ing the ATLAS Payload for Education (ESCAPE) II, Inter-Mars Tissue Equivalent Proportional Counter (ITEPC), Shuttle Solar Backscatter Ultraviolet (SSBUV) A, Physiological and Anatomical Rodent Experiment (PARE/NIH-R), Protein Crystal Growth (PCG-TES and PCG-STES), Space Tissue Loss (STL/NIH-C-A), Shuttle Acceleration Measurement System (SAMS), Heat Pipe Performance (HPP). 1994 November 14 - . Landing of STS-66 - . Return Crew: Brown, Clervoy, McMonagle, Ochoa, Parazynski, Tanner. Nation: USA. Related Persons: Brown, Clervoy, McMonagle, Ochoa, Parazynski, Tanner. Program: Spacelab. Flight: STS-66. STS-66 landed at 15:34 GMT. .